The next step after you have generated a payroll is to pay your employees. You can make payroll payments quickly with our bank integrations. 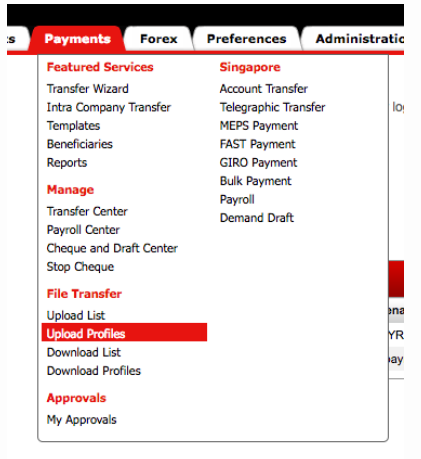 This article describes how to download a DBS GIRO file and upload it to your DBS corporate account using our DBS bank integration. Before using this feature, make sure to call DBS BusinessCare at 1800 222 2200 to activate bank file transfer for payroll, or you will not be able to upload the payroll bank file. Select the Year and Month of the payroll that you want to disperse (usually the most recent generated payroll). Click GIRO Transfer button. A list of banks will appear. Select DBS by clicking on it. Input your company bank details such as Account number and DBS company ID accordingly. Click Download to download the file. Login to DBS IDEAL and go to your IDEAL Dashboard. Click Payments on the tab > Select Upload Profiles from the drop-down list. Check Allow Payment Date Override by clicking on the box next to it. Select Private - Only visible and usable for creator as the Profile Access. Lastly, click on Preview button once you are done. Click Upload File button at the bottom-right corner of the box. 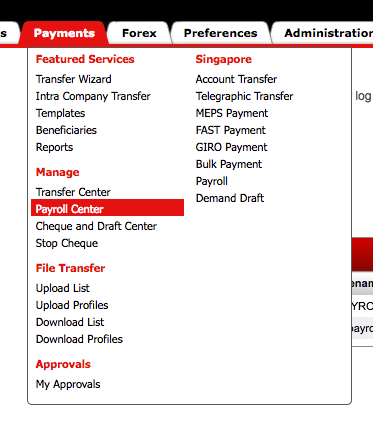 Click Payments on the tab > select Payroll Center from the drop-down list.